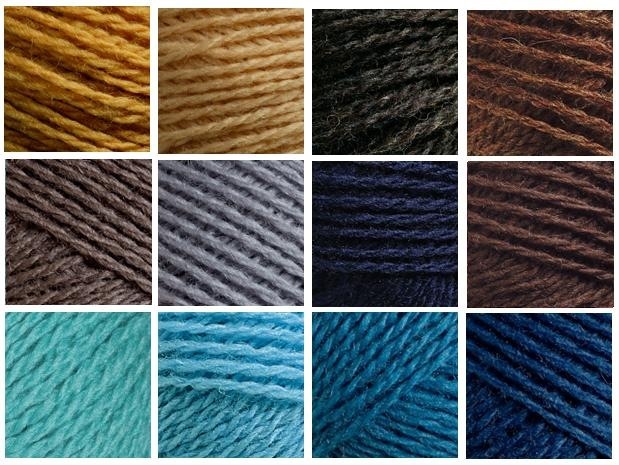 I might be completely crazy to want to knit an entire sweater on 2.5 mm needles, with ump-teen colors of yarn... Oh yeah, and I want the cardigan, so there will be steeking (Eeeeek!) 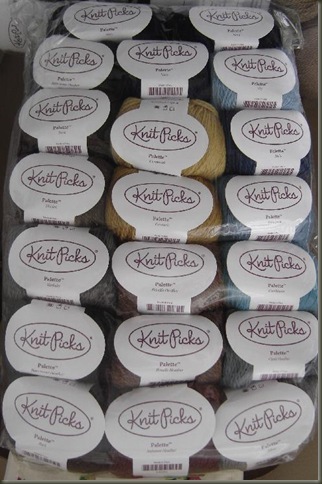 I haven't had the heart to open the bag yet, with all 20 balls of yarn looking so nice and orderly in there, so I'm sharing some of the palette color sample photos. When I open the bag, I'm sure there will be more glamour shots! 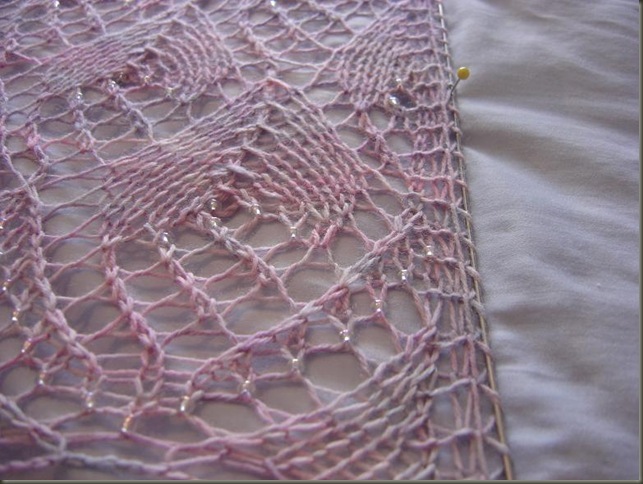 I've been chugging along on my Silver Strawberries Stole... making some progress! 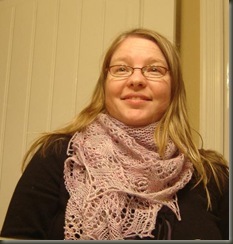 I've finally completed the first "diamond" pattern, which was actually simpler to work than I had originally thought. I am getting more comfortable "reading" the lace, and just intuitively knowing where each element fits. 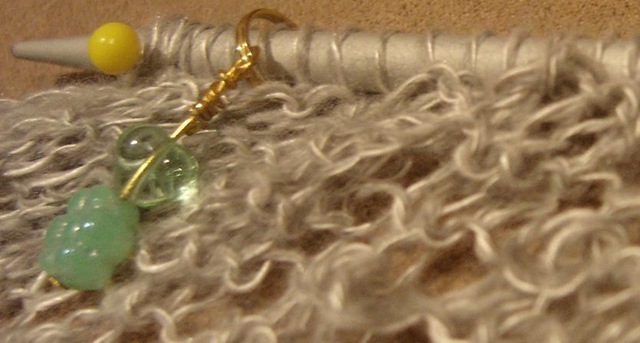 I definitely think that putting in stitch markers has helped a lot. 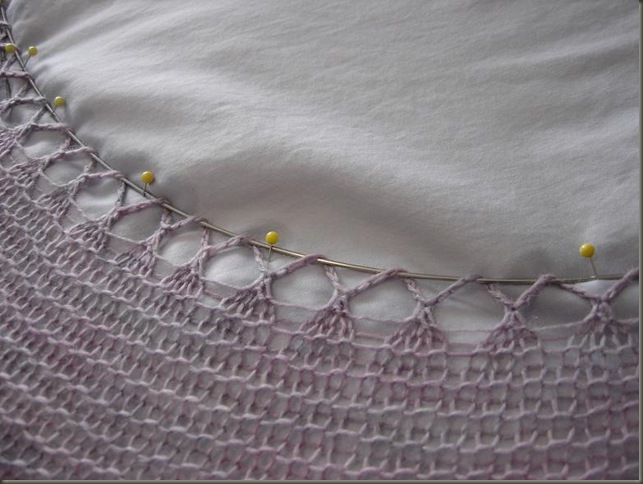 By marking the edges of the different patterns, I am able to see exactly where the motifs fit, and I can tell right away if I've completed the proper thing within the correct number of stitches. As you can see, semi blocked, it looks like the stole will be at least the width of my couch cushion... so that's 20+ inches. 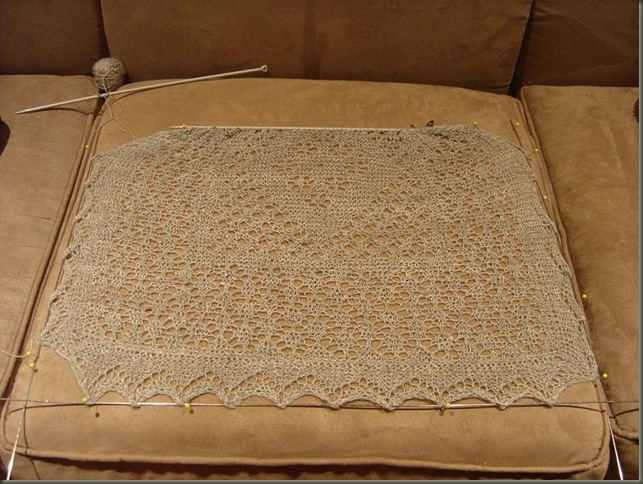 Now I need to decide how long I want the finished stole to be. 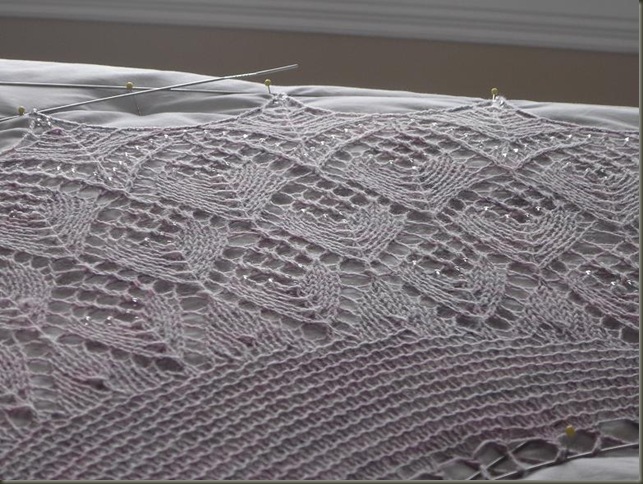 I think I'd like to do at least 4 - 5 repeats of the diamond, but I am not sure whether this will make the right length in the end. 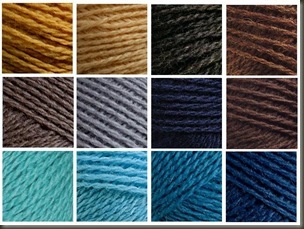 I have enough yarn to make approximately half of the finished stole, so I will knit on, and make up my mind later! The Muse is complete! Blocked and dry, and ready to go! I hear that my comrade polaropposites has blocked hers as well... and I have it on good authority that it is Beee-youuu-teee-ful! For those of you who aren't familiar with the blocking process... the idea is simple. 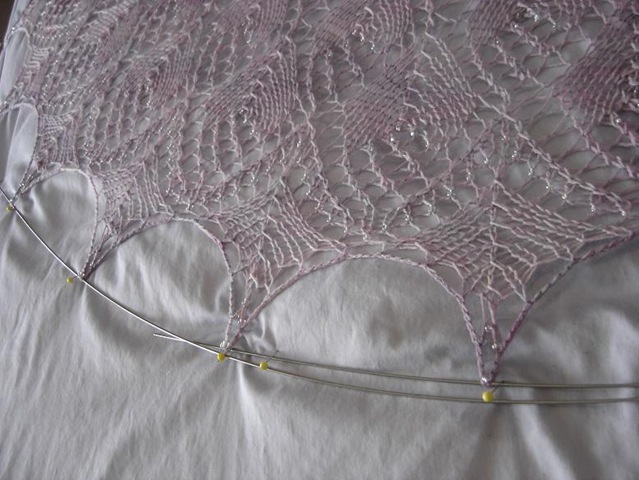 You thoroughly wet the knit lace, lay it out flat on a surface of some sort, and pin out the piece to shape to enhance and open up all of the lace elements. In this case I used a few "helpers"
- Tig welding rods! Cheap blocking wires... you don't have to go and buy a fancy blocking set at the yarn store, instead go to a local welding or metalworks shop and buy some stainless steel welding rods. Thin, bendable, rust free, and about 20$ for a whole pound of them! I just wiped mine down with a damp cloth when I got them home, and they've been great ever since. Mine are around 40 inches long, and perfect for the job. 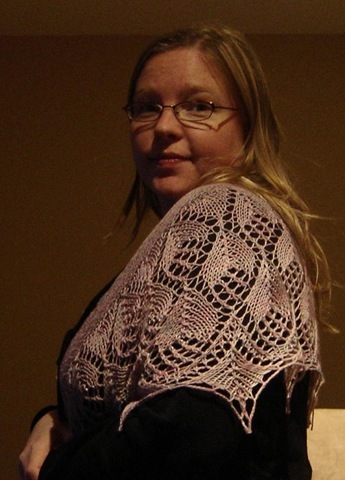 - Measuring tape... when you aren't sure if you are pinning the shawl out symmetrically. Does this point look longer than that point to you? Measure it! - Soaking basin... aka a repurposed mixing bowl. My family gets annoyed with me (read husband) when I leave woolen things soaking in various sinks around the house. I soak for around 30- 45 minutes. You can add soap/hair conditioner/wool wash in your soak. I like it plain and simple. Clean shawl? doesn't need soap. So here we go... 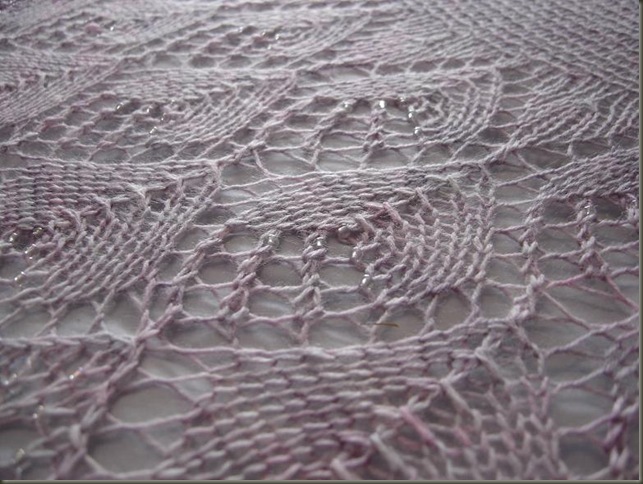 Since blocking highlights the best characteristics of Lace, I thought I might use the blocking photos to show the best characteristics of this shawl! Allegheny Muse starts in an unusual way... with a crochet beaded cast on. I wasn't sure what to think in the beginning... but look how nice the points block out! 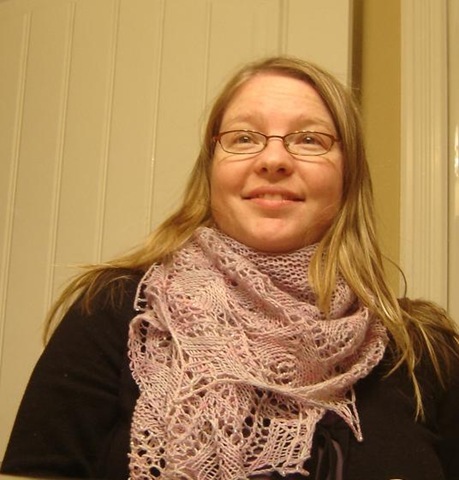 The crocheted cast on is nice and "loose" and stretches just the right amount to create those dramatic arches of lace. I must admit, I think my favorite part of a lot of shawls is that dramatic arch edging. The bead placement for this edging was also top notch. The four beads at the very ends of the points dangle and sparkle at the perfect angle. 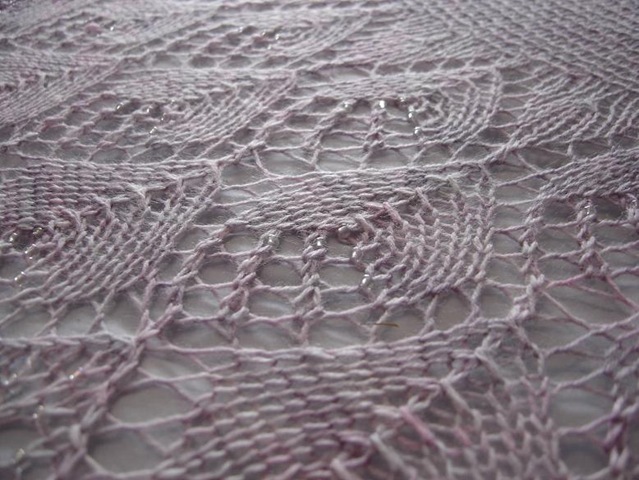 The main lace panel section of this shawl was quite enjoyable to knit. The few rows here and there with no beads were a nice refreshing rest, and then back to the mega-beaded rows. The break was much appreciated! The lace stitches were pretty basic ones, K2tog, central decreases, lots of YOs and clear instructions on where to place the beads on the decrease stitches made the lace quite straightforward. I found the placement of some of the internal beads to be a little wonky, but maybe if I had blocked more severely they might have come out more "even" in the end. 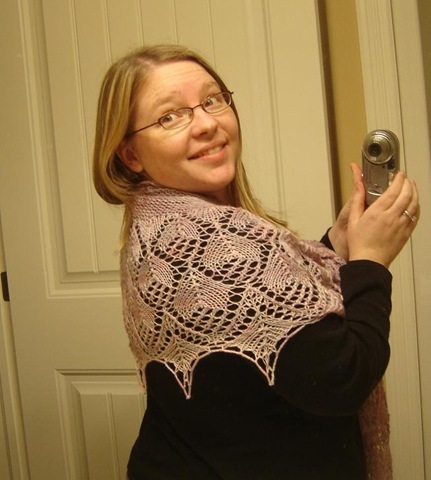 One thing that was unusual for this shape of shawl is that you don't start with shorter rows that increase over time to be longer and longer like you would with a triangle shawl. 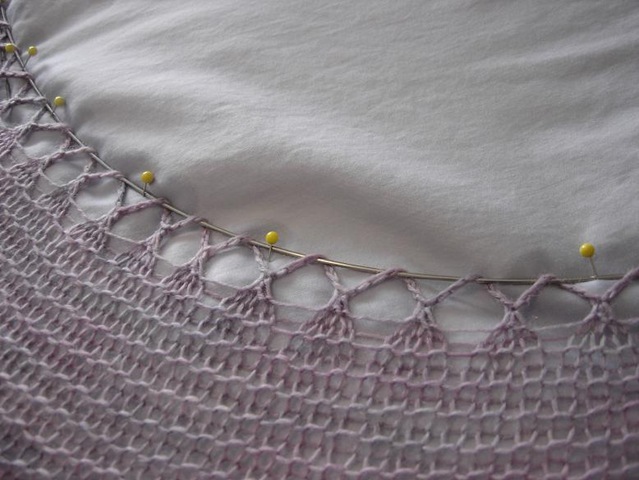 The edging began with many stitches, and you maintained that number throughout the lace panel, losing a few on the last few lace rows, and then completing the garter section with short rows to create the crescent shape. 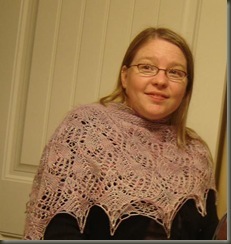 All in all, I liked the process and the elements of this shawl very much! and I am pleased with the final results. 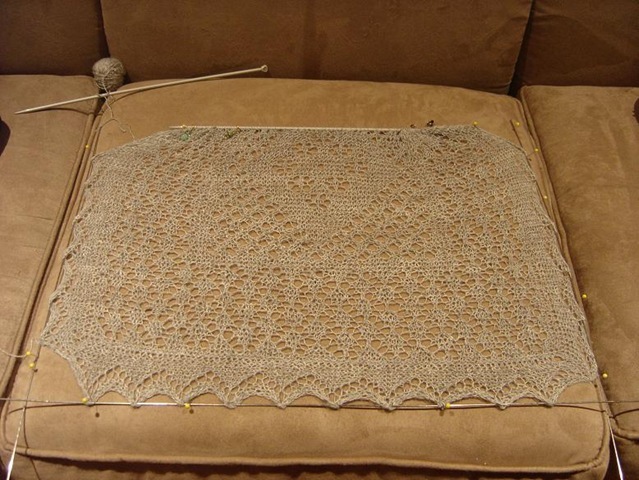 The cashmere blend yarn really blocked well, and feels soft and drapey in the finished piece. 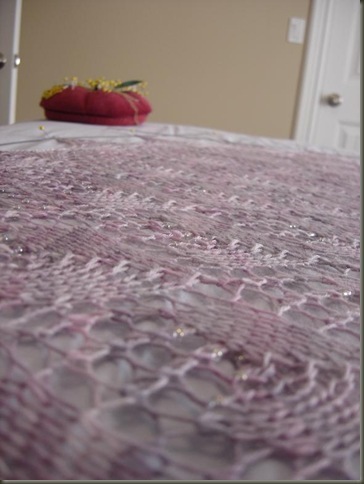 The opalescent beads I chose have just enough sparkle to be seen, but not overpower. 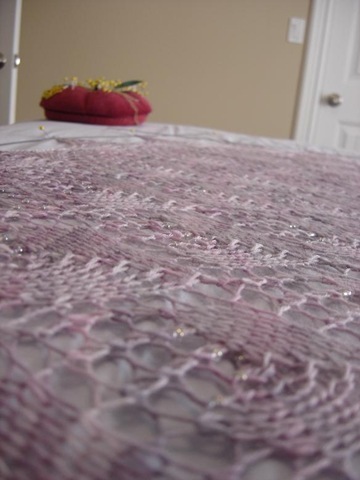 The effect is kind of like dew on a rose... you know it's there, and it enhances the design, but doesn't take your attention completely from the elegant lace. Some people like contrasting beads, but I tend to like the blending-in strategy more often. 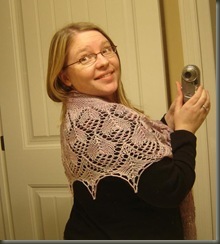 getting people to take shawl pictures is hard.... I tried the usual bathroom "Self-Pose-Photoshoot" and got a few decent ones. 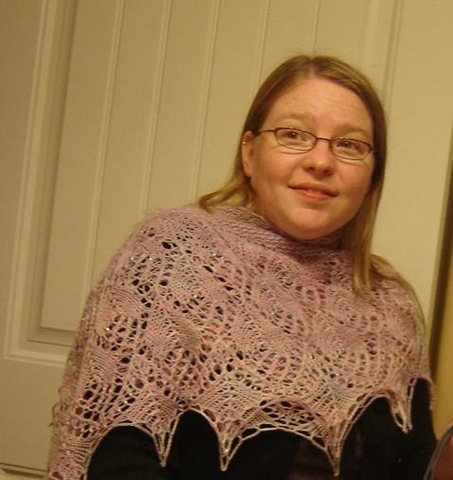 The shape of this shawl is more long and skinny than some of the triengle ones I've made in the past, so I'm still not sure how I should really wear this one. Jumbled around the neck? 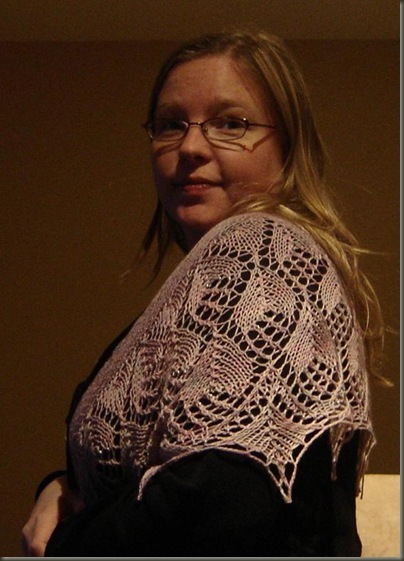 simple shoulder drape? double wrap? I think I might have to play with this one a little more to decide. I do very much love the color though! Soft Purples and pinks, paired with the opal shimmer of the occasional bead. All in all - a very nice pattern, very well written, with neat style elements, fun sections, and a chance to learn several new techniques and skills. Allllll gooooood. I just bought a copy of Hunter Hammersen's new book Silk Road Socks... and it is fabulous! I hope we get to do a pair from there! (please please?) I think the plan is to choose something next week for the cast on. 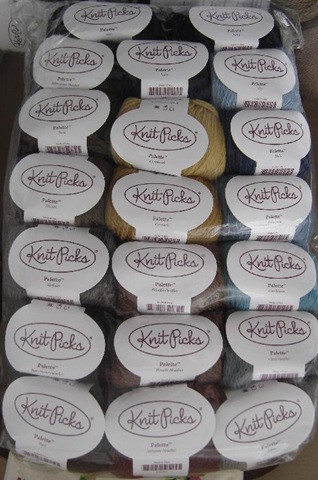 I'll make sure to post in case anyone else out there is interested in knitting along with us!